"You know, I just had a feeling that I was going to win this," Boeree was overheard saying in the ladies' during the dinner break - PokerNews has spies everywhere. But superstition aside, Liv Boeree brought her A-game with her to San Remo this week and did not miss a trick. With her biggest single cash up to this point being the European Ladies Championship for what now seems a measly $42,000, Ms. Boeree is going to have to get used to being a Euro millionaire - she has outlasted 1,239 players to take down the biggest EPT ever held in Europe. Almost unable to speak with emotion in her winner's interview, no-one can doubt that this means a lot to Boeree over and above the extremely tasty pile of money she is about to be presented with. Having spent the past few years immersing herself in the tournament scene and grinding her way through every tournament she could find on the international circuit, she's been due a big win for some time and she couldn't have picked a much bigger one. Once Boeree acquires the power of speech once again, it's safe to say that there's going to be some serious, serious partying in San Remo tonight. We wouldn't even be surprised if the hangover spills right over into the Monte Carlo Grand Final in a few days' time, to which Boeree has also earned a complimentary seat. Yes, there is going to be some merriment on the Italian Riviera tonight. Many congratulations to Liv Boeree and all her worthy opponents at the final table - it's been one of the best we've seen. Until Saturday in Monte Carlo, it's goodbye from all of us at PokerNews, PokerStars.it and the Casino San Remo. Over and out. Liv Boeree raised to 700,000 from the button and Jakob Carlsson shoved from the big blind. "How much more please?" Boeree asked in a level tone that suggested that she meant business. 6,350,000 was the answer. Jakob Carlsson minraised to 600,000 but Liv Boeree moved all-in again. The Swede mucked once more, she moved to over 30 million in chips. Since then, the blinds have gone back and forth as our heads-uppees take turns raising the button and folding the big blind. 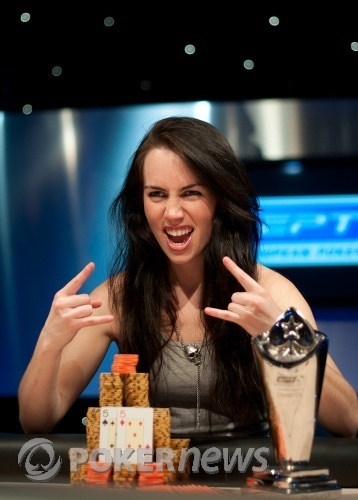 Jakob Carlsson raised to 650,000 but Liv Boeree reraised all-in. Did Carlsson want to play for it all this hand? No, it seemed not. Boeree still with a huge advantage. Two players remain, and Liv Boeree has a massive chip lead. By the by, if you're wondering where the antes went, they were removed when we went heads up. So there you go. Wow, what a time to go on break! Nevertheless, a one hour dinner break has been declared, and we'll be back to finish this fight after that. From the small blind, Jakob Carlsson opened with a barely-minimum raise raise to 525,000. Boeree came along with the call, and the flop brought . Boeree check-called a bet of 600,000 there, and both players checked the river. That brought them to a river . Grabbing the betting lead now, Boeree fired out 1.5 million at the pot. 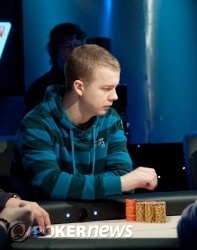 Carlsson had raising on his mind, and he made it 3.9 million straight as a slightly puzzled look crossed Boeree's face. She asked for an estimate of her opponent's remainder before announcing an all-in three bet. Carlsson took a minute to save face before sliding his cards back to the dealer, and Boeree's lead continues to widen.